Scholarship Requests Are Coming In! We have received 30 scholarship requests so far! Children are looking to attend Basketball Camp, Camp Carefree Diabetes Camp, Baseball and Softball Programs, YMCA Summer Program in 2 different towns, Music Camps and Park & Rec Summer Programs. Consider making a donation to help these children have a wonderful summer in honor of Doug! Get Ready To Tee Off in 2019 on June 21! A Beautiful Day To Come Together For The "Power Of Doug"
Please join us on Friday June 22nd at Owl's Nest Golf Course in Campton, NH. We will come together to honor Doug, play golf and raise funds for children to attend camp! This is the 12th year of helping children. We awarded 150 scholarships last year and we are on our way to surpass that number. We look forward to you joining us on the 22nd, tee off is at 1:00, come early, grab lunch and meet friends. Thank you for all your support. Thank You for a Very Successful 2017! The Captain Douglas DiCenzo Camp Fund would like to thank everyone who help make 2017 such a successful year. The Camp Fund awarded 150 scholarships to children. These children participated in camps, activities or special programs. Some went to Boy Scout, Girl Scout, YMCA and various Park and Rec Camps. Some attended Quiz Bowls, Camp Gotalikeachallenge and Writing Seminars. Some took part in Mission groups, President Trip to DC and more. Most children were awarded a partial scholarship to fulfill their opportunity. We received many Thank You Notes from children, telling us about their special experiences. We are thankful to the “Power of Doug” and all his supporters. We look forward to another successful year in 2018. Wonderful thank you notes from children that have received scholarships to attend camps and programs. Thank you to all of you for supporting the Captain Douglas DiCenzo Camp Fund and help children with a new adventure. The Annual Captain Douglas DiCenzo Memorial Golf Tournament will be held on Friday, June 22, 2018. Owl's Nest Golf Course, Campton, NH. 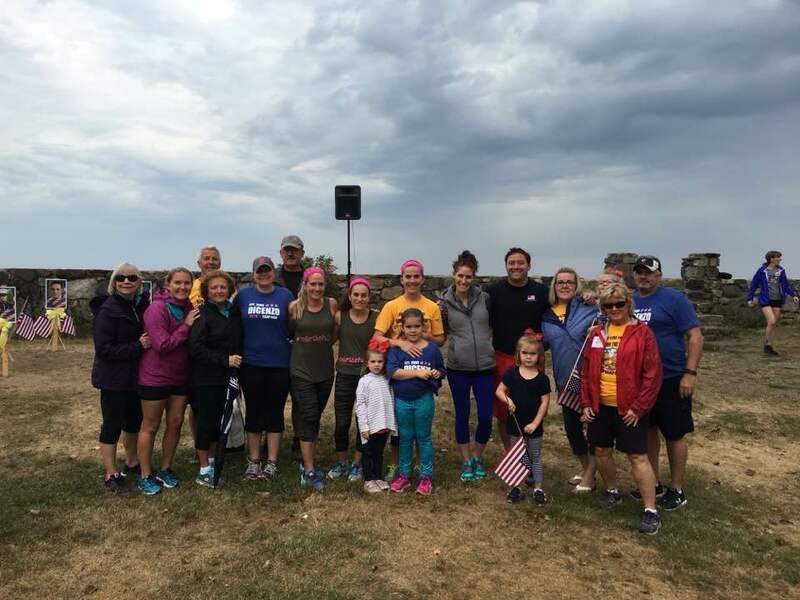 NH Run for the Fallen took place on Sunday, September 17th. Thank you to every one who came out to Honor and Rememberall the Fallen. Captain Douglas DiCenzo Camp Fund Came In First. The Captain Douglas DiCenzo Camp Fund came in 1st for the Festival of Trees At the Common Man in Plymouth. Thank you all for voting. around the fire, shot BB guns, and a bunch of other really fun activities. that I can go back again next year! Thanks again so much for helping me go to camp! Flags on the 48. Honoring 9-11, Never Forget! Meghan very much enjoyed her summer ballet intensive and the assistance from the Captain Douglas DiCenzo Camp Fund helped make her participation possible. I've attached a few pictures of Meghan from the program. She is pictured with Debra Austin, Carolina Ballet ballet master and former principal dancer with Pennsylvania Ballet, and soloist with New York City Ballet; Margaret Severin-Hansen, artistic director Carolina Ballet Summer Intensive and principal dancer with Carolina Ballet; and partnering in pas de deux class with soloist company member Rammaru Shindo. Thank you very much for your support over the years. Meghan's technique always improves with the summer programs. This year in her ballet studio's production of the Nutcracker she will performing the coveted role of Sugar Plum Fairy. We are very excited for her and proud of her hard work and dedication to the art form. This tournament is a great opportunity to honor Doug for his service to our great nation and to provide children with an opportunity for adventure. Thank you for all your support! More photos to come. Sports Auction Items for The Captain Douglas DiCenzo Camp Fund. Come bid at the golf tournament at Owl's Nest June 24. 1. NFL Autographed Football. Teddy Bridgewater, quarterback for the Minnesota Vikings; 2015 Pro-Bowler, Pepsi NFL Rookie of the Year in 2014. 2. Sammie Coates Autographed Jersey. Sammie is a wide receiver for the Pittsburg Steelers. June 24th is the 10th Annual Captain Douglas DiCenzo Golf Tournament . Sign up now! Friday, June 24 at 1:00. Shotgun start for the 10th Annual Captain Douglas DiCenzo Golf Tournament. Come honor Doug and help children go to camp through the "Power of Doug". Mark your calendars for June 24 @ 1:00 for the 10th Annual Captain Douglas DiCenzo Golf Tournament at Owl's Nest Golf Course in Campton, NH. The "Power of Doug" will help us raise money for Children. Many children will attend a variety of camps because of Doug! Students from Plymouth Elementary School placed wreaths at the Veterans Memorial Monument in front of the Plymouth Town Hall. The wreaths had the names of all the fallen from NH. The wreaths honored all that have served our country. We remember, honor and thank them for their service. Hot Auction Items for Golf Tournament! Matt Ryan Signed Jersey with Certificate of Authenticity! Matt Ryan Autographed Falcons Jersey. With Certificate of Authenticity. Priceless!